Aloe Vera is a succulent, almost sessile perennial plant with radically arranged leaves and many fibrous supporting roots penetrating into the soil. Aloe Vera barbadensis miller as scientifically known originated in warm, dry climates of Africa. However, its wide adaptability and importance as a medicinal plant had it distributed to other parts of the world. In Uganda we commonly call it ‘Ekigagi’. 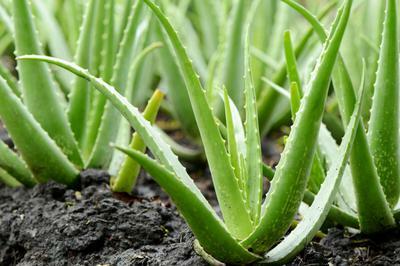 There are no varieties of Aloe Vera released for Ugandan consumers, but there are known species like; Aloe Aristata,Aloe Ferox, Aloe Arborescens,Aloe Marlothi,Aloe polyphylla,Aloe plicatilis,Aloe Dichotoma. Aloe Vera can grow in the driest and poorest of soil but optimal yields are got when well drained sandy loam soils are used, with a pH range of up to 8.5. Due to the fact that the plant roots are shallow the soils should be friable. Aloe plants well propagate through vegetative means. This is normally done using root suckers (pups) or by use of cuttings of the new growing rhizomes. The best way to start an Aloe Vera plant is by using 4 month old suckers having 4-5 leaves, and about 20 to 25 cm in length. To plant open up pits 15 cm deep and place in a sucker while maintaining 60 x 60 cm spacing. After planting, firm the soils around the root zone by pressing to remove air pockets. Also make drainage channels in the field to ensure surface run off and to avoid stagnation. To enhance soil nutrient composition manure may be added at the time of soil preparation and even in subsequent months as the plant grows. Weed the field to cut off competition of nutrients. During the first years of planting you can fully utilize the spaces that are open by inter-cropping with less competitive crops like legumes, sesame, coriander, cumin etc. also watch out for sun tan, especially during sunny conditions the sun usually turns them brown. In 18 months from planting the Aloe Vera plants will be ready to harvest. To harvest, remove the outer older leaves manually using a knife leaving the fresh young leaves on top to grow. Economic yields are obtained for a period of 60 months, and after this means you need to replace the mother plant. Use of the Aloe Vera plant is dated as far as at the start of human civilization. The plant has market starting with your local neighbors, cosmetic firms and even medicinal companies. Pharmacologically the plant is taken as an immune booster and detoxifier, and is particularly used to treat diseases connected to the digestive system. On a well prepared land open up planting holes of about 15 cm deep. Get your well cultured Aloe Vera sucker and place it in a hole at an angle. Cover it with soil and gently firm to remove air pockets. Water gently to provide moisture. At 6 months after planting or before planting you can amend the soils with manure to boost fertility of soils. Harvest your leaves when they start developing viable leaves.